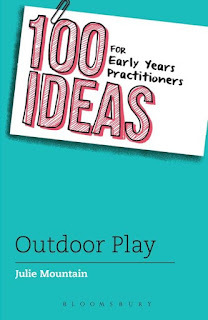 I have been enjoying perusing my copy of Julie Mountain's latest 'must-have' book for those working in the early years - "100 Ideas for Early Years Practitioners - Outdoor Play" and when I was reading her 'Idea no. 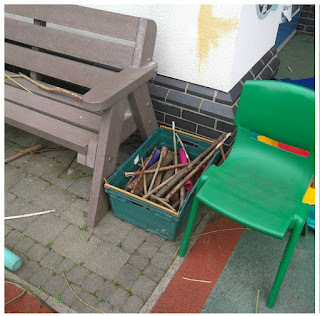 18: Sticks' I was reminded of why these are such an important part of our playground and our outdoor play approach. I spent all day thinking about how we came to have a collection of sticks available in the playground and then I remembered that one summer I got a load of willow with a view to letting the children whittle with the following year. Of course the idea of storing a crate full of sticks for almost a whole school year just proved too much and we decided to put them out and let the children play with them. We did spend time explaining to them about not pointing them each others faces or hitting anyone with a stick but honestly neither has ever really been an issue. 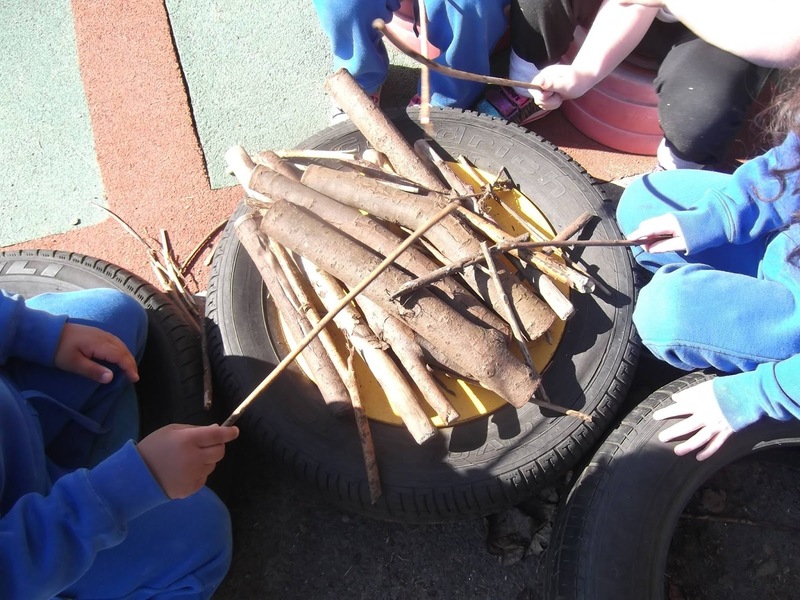 What never ceases to amaze is that all young children seem to know that if you grab two sticks and rub them together you can make a fire - is that our caveman DNA emerging?! 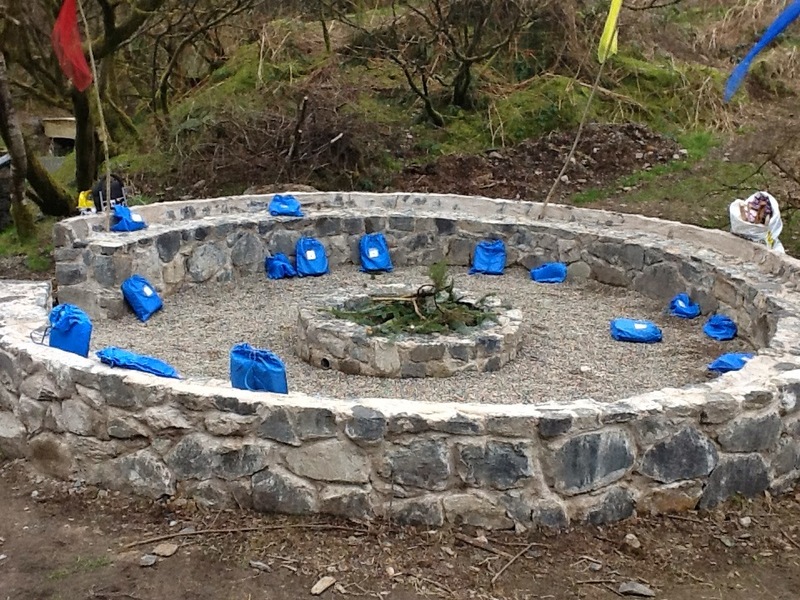 Some children have recreated a campfire and are toasting marshmallows! For third term we also introduce some longer sticks that require skill to carry about without tripping over them or poking people, so again we talk about holding them upright when walking about with a stick. 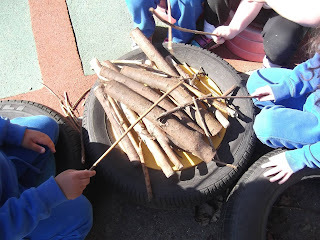 Each year the play can be very different with a box of sticks but each class does invariably incorporate them into their play. One year a boy had a particular stick he always played with, to all of us adults, it looked just like any other stick in the box, yet he and the other children had no problem clearly identifying this one stick as his! 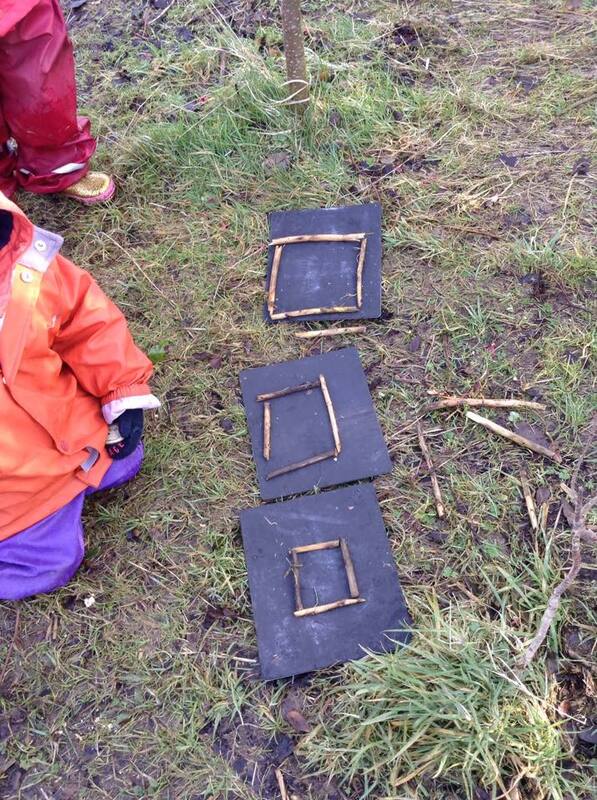 The sticks are great for use in cooking in the mud kitchen as they make natural stirrers or even pretend spoons. We now have enough of a forest feel in the playground for the children to have ready access to smaller sticks if hey need them as ingredients for their cooking too. 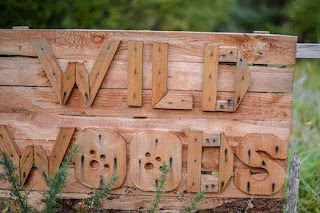 We also have a box of sticks up in Bear Woods, our little wooded area on site that we visit on a weekly basis & it is interesting that the children play with these sticks in a different way form in the main playground: the long sticks tend to be fishing rods and the smaller ones are wands or get broken up for use in transient art. Sometimes it is easy to forget how much the sticks are just part of play now at our nursery and it's only when they have to be taken away that it becomes apparent just how much the children do use them. 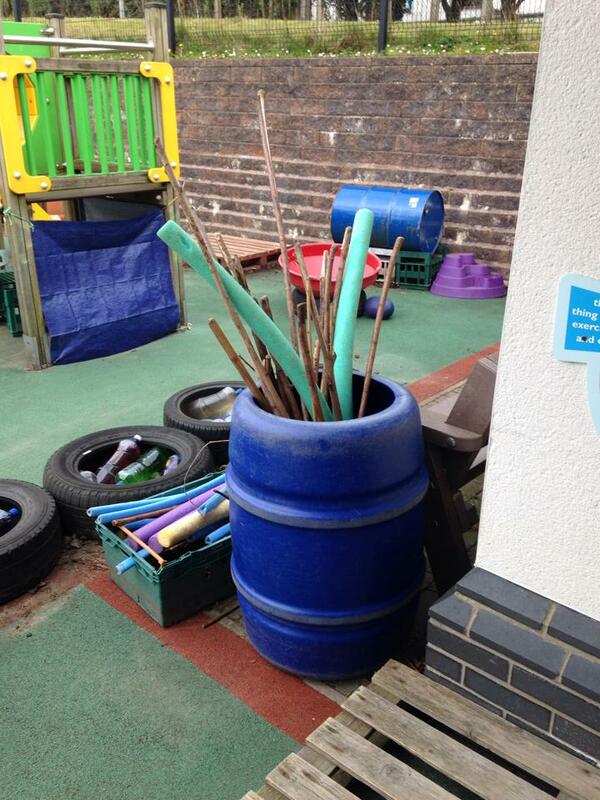 Last week, we had children visiting from one of our partner schools we put all the stick away. If children are not used to playing with sticks that is when accidents will happen plus it is just too hard for staff not used to stick play to grasp their use in such a short time. While the children played outside waiting for their friends to arrive, some began to search about for the box of sticks, that had found one or two lying on the forest are and now they need more for their game, I have to say they were not pleases when I explained they had been put away that day and hey fell upon the next morning as if they were the most precious resource ever invented! 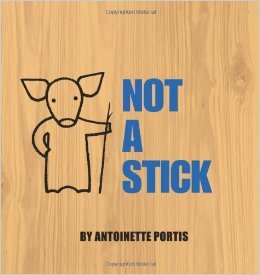 I like to think that the children in my class can understand the book 'Not A Stick' just a little better than any counterpart who isn't allowed to play with sticks. Farewell to the Outdoor Play Party. Sadly this is the last Outdoor Play Party, after a few years co-hosting this link up of outdoor play posts from bloggers around the world, it is time to call it quits. I first joined in with the original co-hosts Mama Peapod and Greening Sam & Avery. As their lives got busier they had to leave the party but it kept going with The Golden Gleam and Kitchen Counter Chronicles (KCC) and myself. We have had some other bloggers join in for a time - Flights of Whimsy, Happy Hooligans, Making Boys Men & The Usual Mayhem. More recently it has been Rain or Shine Mamma, Mud Mud Marvellous Mud and Adventure Togs with myself and KCC. But alas all good things have to come to an end, we are all busier and moving in different directions and finding the fortnightly link up party too hard to maintain. I will continue to blog about getting outdoors & some of the adventures of my nursery class & I hope that all those who have supported the Outdoor Play Party and my blog in particular will continue to interact with me on any posts, I always look forward to getting comments on my posts. 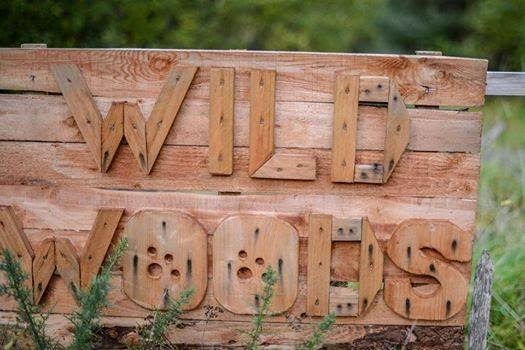 So this week we had our second visit to the Wild Woods at An Creagán, I am a big advocate of allowing children to revisit familiar sites and to allow them to have time to explore freely and enjoy trying skills over and over. For this visit, I could allow the children to run on ahead on the path until they found the gate, I loved that those who got there first just sat down at the gate waiting for the rest to catch up! Peter, the bio-diversity officer had lit the fire so at the gate, I explained they couldn't run on ahead but had to walk with an adult in front because of the fire. Because we have a fire weekly in school these children are used to being around a fire and they knew to walk round the fire to get a seat. 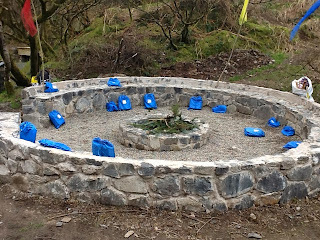 The fire circle where we sometimes have lunch. They had been talking about what they were going to do since their last visit - catching a newt was top of some lists, climbing up the steepest bank on another & enjoying tea at the fairy tea party topped a lot of lists! 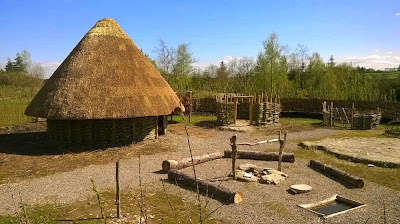 After listening to Peter talk about how he was going to make them some charcoal, the children had a request for him - they wanted to have lunch in 'the straw house' - a Bronze Age Hut recently built in an authentic village within the larger site. After hearing they could have lunch in there they were free to go and play. The tree house, the children can really feel as if they are inside a tree! It is a wonderful site where the children can really feel they are out of sight when really they are visible to all the adults. 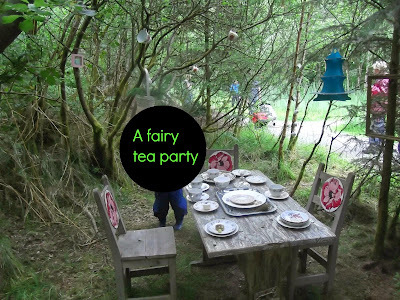 I love that they can spread themselves all over the site, they will be pond dipping, climbing the banks, playing in the tree house, having tea at the fairy tea party, cooking in the kitchen, digging or playing with water in the barrel. And even with all that is on offer there is also the option to just sit on a rock and watch the world go by. A table with beautiful china set up for the children to enjoy. We allow the children to just be, there is no end result of our visit other than that they have fun and enjoy themselves. It is always so wonderful to see a quiet, timid child having so much fun just gathering stones in a bucket or sliding down a muddy bank. We usually have just over an hour to enjoy just playing before I blow the whistle 3 times to signal it is time to go back to the seating area. 'The straw house' where we had a lunch. This time rather than have lunch around the fire we walked back to the entrance and had it in the Bronze Age Village in the 'straw house'. The children loved this experience - as far as they were concerned it was a much better version than the one the little pig made! This village has been built using traditional materials and methods and the hut is a real work of art - the walls are woven willow and were just starting to sprout leaves. After lunch the children had a play in the play park before heading back to nursery on the bus.We had lot of tired, wet and muddy children but thankfully most parents are always delighted to see the muddy faces as a true sign of a really fun filled day. 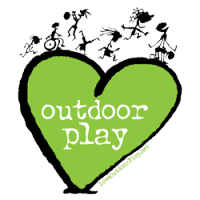 A massive thanks to all of those who linked up to the Outdoor Play Party last time, I hope you will all grab the 'featured at' badge and continue to keep on promoting great outdoor play in your blogs. In any given day a nursery teacher has to make a lot of decisions on whether something is an acceptable use of resources or not. Every individual will have their own style of deciding whether something is allowable or not, mine usually involves whether it will ruin an expensive resource or end up costing more money to replace. For any teacher who allows the children to have total free rein in the classroom or playground and that allows resources to be moved around from station to station, I have to say I take my hat off to you, I am all for child led play but when it comes to resources that I know cost a lot of money and can't be replaced easily is lost or broken, I draw a very clear line on acceptable use. Therefore you will hear me telling children to take toys back to the table where they had been set out on rather than carrying them around the room or playground. But there are of course other larger items that can be moved about. Generally the smaller or more expensive the item the less inclined I am to allow it to move from its original place! I don't know about anyone else but sometimes it seems that a group of children are great about using lots of resources but terrible about putting them back at the end of play - this is probably more true outdoors than indoors. It can seem easier to just pick things up myself and put them back but then how will the children ever learn this skill if an adult always does it? On Friday I was faced with such a decision - one child took a bucket and spade from the sand pit over to our forest area and began to gather up a load of bark chips from the forest floor. I quickly assessed that this was an acceptable use of the bucket and spade, he told me he was building a new road and soon he had a whole road crew working alongside him. Then they began to move out of the forest area into the wider playground with their buckets of bark chips, I made a decision to say 'No, the bark chips must stay in the forest area' as I knew they would end up leaving a trail of bark chips all over the playground and we need them to stay in the forest area to maintain that forest floor feel. I did however move a red top over into the forest area for them so they could continue to fill it up and this allowed their play to evolve as they moved onto cooking with the bark chips. Inevitably one child then wanted to add water to the top to mix in with the other dry ingredients. Another decision had to be made - the rule in my setting is they must wear rain clothes (waterproofs) if they want to play with water. So I explained that if he wanted water he needed to get on his rain gear but as the majority didn't want to do this, when he got his rain gear on, I then had to direct him to the mud kitchen for his wet play. The reason we ask children to wear their waterproofs to play with water is that we have 28 children and if even 4-5 get wet during play it is a big deal to get them changed so it is just much easier if they are properly dressed from the start. After an hour of so of intense play from two groups in the forest area and mud kitchen, they all moved off to different play of course just leaving all the buckets and spades lying where they had been playing. So before they got their shoes back on I asked the children who had been engaged in this play to go and gather up the buckets and spades and take them back to the sand. As a nursery teacher, I am constantly challenged by the children in my class and my practice has to evolve with their needs but I don't see any harm in having some boundaries of acceptable use of resources in place. I don't know of any teacher who does not find themselves with a collection of 'stuff' as soon as they begin their career and I reckon those in the early years are probably the worst. I find myself eying up bread crates, cable reels and pallets as I drive along and sometimes only the fact that my boot is already full of accumulated 'stuff' I would stop and gather more. Teachers love free things even more than anything and a lot of the resources in my playground have been gathered up for little or no cost over the years. It never ceases to amaze me how much fun children will have from something another person saw as rubbish. I always love to see how the children will use some of the things that I do add, it is rarely how I thought it would be used either. We are so fortunate to have The Play Resource nearby and as members we can take as much from the scrap store as we can fit into a car! We usually go for a visit twice a year to gather up as many new resources as we can, mow of it is used for craft purposes but occasionally bigger items are in stock that be used for construction indoors or for play outdoors. Earlier in the new school year I spied giant styrofoam pieces down in the Play Resource. I could only fit 2 into the car - they were about the size of a surf board. I had no idea what their purpose was going to be but knew we's have hours of fun with them. At first the children used them as a roof on one of the platforms on the slide, then the slid down them on wet days. They were light enough for the to carry about but solid enough to hold 2 children if they stood on them when balanced on some crates. It is amazing to see them still being used almost 6 months later & for something so inventive. 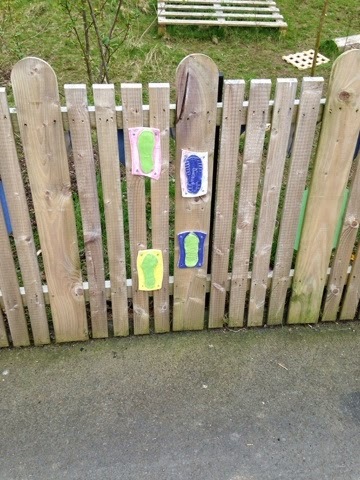 I ended up cutting one of them in 2 and last week one boy discovered he could fit them behind posts on the fence - 'Look at my new wall I just decorated' he announced. 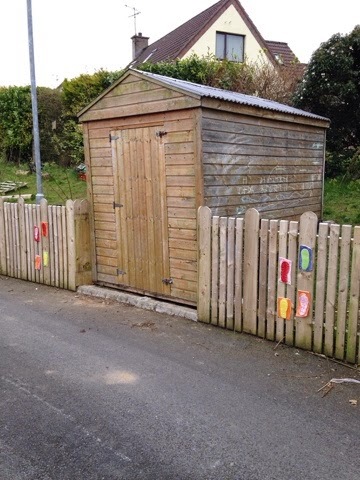 I had also picked up some old 'For Sale' and 'To Let' signs made out of corriflute and when mounted with the white side showing, these are a great canvas on the fence for the children to paint on, you can see 2 of them in the photo too. When it comes to free stuff, my advice is grab it while you can and worry about it will be used for later! Whilst not being a huge fan of blog nomination awards that mean people nominated have to then nominate others and so on and so on. I am very flattered to have been chosen by @DeborahFielden in what is her inaugural blog post - congratulations on taking that first tentative step into the blogosphere! I was also honoured to be in such great company too. 1. @MrMalcontent - I was 'stuck' on Twitter going nowhere fast when I got some great advice from Barry about how to get it working for me as a CPD tool. Barry is an inspirational Key Stage 2 teacher, always innovative, challenging himself and his pupils all the time. He never rests on his laurels and is always looking for the next thing to introduce to enhance his teaching. A Microsoft Expert Educator, Barry is one of the main driving forces behind #TeachMeet in Northern Ireland, his enthusiasm is infectious and you can't spend any time in his company without being as enthused as he is. 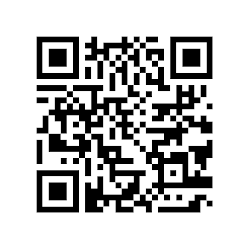 His blog NIbcorrigan is full of practical ideas for teachers to employ technology in their everyday teaching. If I ever have any techy questions I know Barry is the one to turn to and he never makes me feel 'stupid' for asking such a question. 2. @hechternacht - One half of the brains behind #kinderchat, Heidi is an amazing bundle of energy who manages to combine teaching with organising weekly twitter chats, on line real time chats known as campfires and blog too. Her joint blog Kinderchat is an amazing tool for any EYFS teacher. Every Monday during the school year, Heidi can be found taking part in both the European and North American #kinderchats. She is always so professional in all her dealings and makes it feel as if you are life long friends meeting up for a chat over coffee and cake. I honestly don't know how Heidi finds the time or energy to do all that she does. 3. @CreativeSTAR - what can I say about the amazing Juliet Robertson of Creative Star Learning Company - Juliet is the reason I started blogging myself. I read her blog and was so inspired by the simplicity of her approach and the fact she was UK based helped too, before that I was only following more international blogs. I loved that Juliet's posts were full of practical ideas and tips to help even those with the most dismal outdoor spaces to get outdoors. 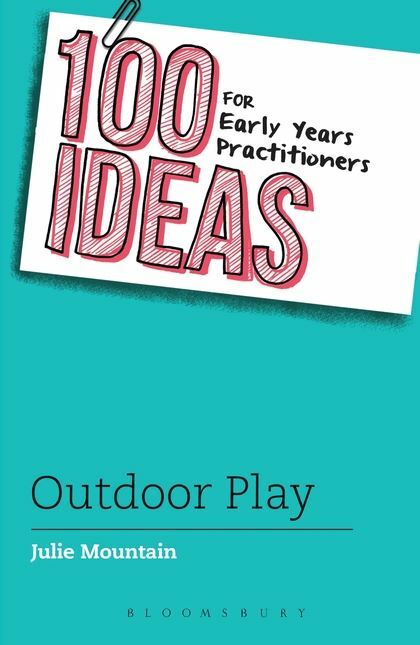 Her book 'Dirty Teaching' is a fab, easy read full of great ideas any teacher could use to begin taking the learning outdoors. Juliet is selfless in her support of others too, always taking the time to comment on blog posts or share good ideas. If you ever get the opportunity to see her present, grab it with both hands! 4. @blamehound - another inspirational EYFS Tweeter, Nicola is one of the main reasons I got involved in #kinderchat, she is always so helpful to new colleagues and to those taking their first steps into the wonderful world of Twitter. Nicola is always willing to share her good practice and professional knowledge with others. 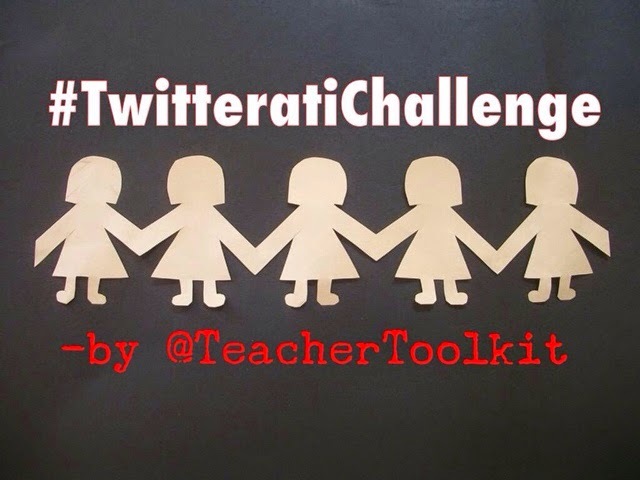 She has been involved in 2 of the ebooks created by the #EYFSTwitterpals and if any NQT needed just one person to start following on Twitter I would advise them to begin with Nicola. 5. @daithi - The Bill to @MrMalcontent's Ben! Dáithí was another teacher who helped me make Twitter work for me, he advised me to look for # that appealed to my educational interests and to build up a network that way. He is also another of the organisers of #TeachMeet in N.I and each time he presents it is inspiring to witness his enthusiasm and belief in the pupils he teaches. Another selfless individual who is always willing to answer any questions and offer unfailing support to colleagues, he and @MrMalcontent provide the full package for technical support as Barry is a firm Microsoft advocator and Dáithí a real Apple head! One of life's true gents. 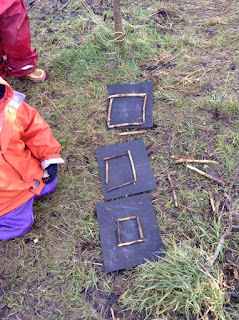 Outdoor Play Party - Outdoor Art - Part 2. The finished sea scape and beach scene! 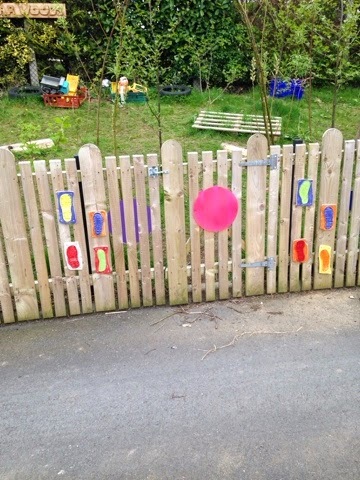 Over the past few months the nursery class has created lots of outdoor art, mostly for Bear Woods, our little wooded/wild area above the nursery. In February thanks to funding from the Integrated Education Fund, we were able to work with our partner school, Sperrinview and professional artist, Grainne Kielty, to create clay footprints for the fence up in Bear Woods. 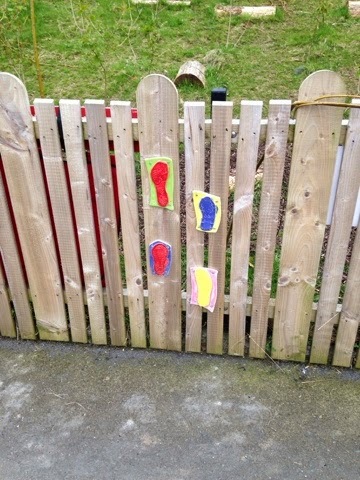 All 40 children involved in the project made a print of their welly boot or shoe in clay and then after they were painted and glazed our caretaker was good enough to display them along the fence. Then I also applied for funding from The Play Resource in Belfast to allow the children to work with another professional artist, Fionnuala Duffin. 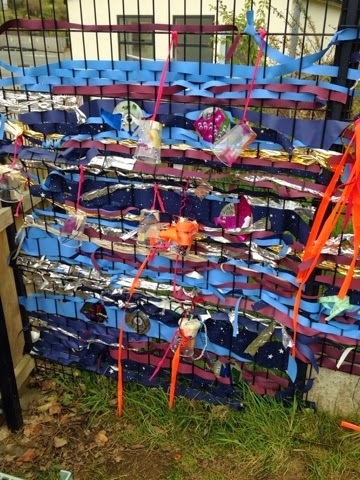 I sent her some photos of the fence up in Bear Woods and Fionnuala came up with a greta idea to help decorate the fence with some weaving. 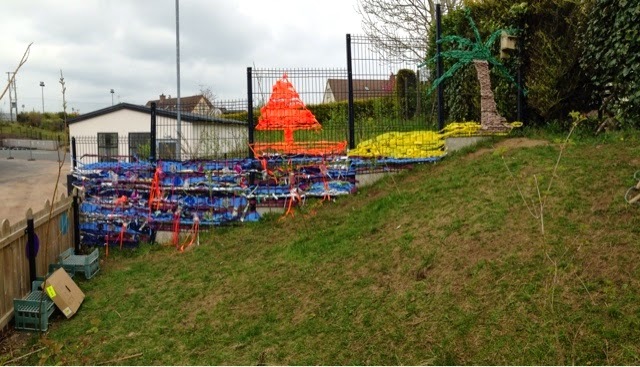 However, not just any old weaving the children created a beach scene over 3 days by weaving strips of different coloured and textured materials into the fence. They also made some jelly fish from recycled plastic containers and fish from old CDs. 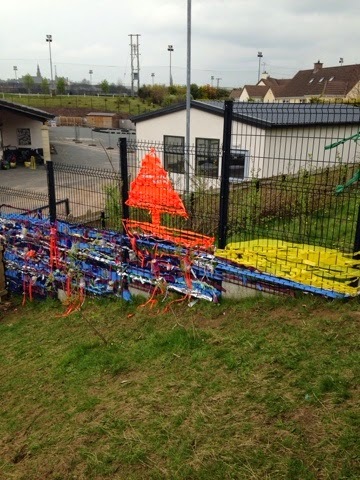 These were tied along the fence and placed between the plastic sections of the fence in the 'sea'! They also made a big octopus and snail to go live outdoors in this space too. 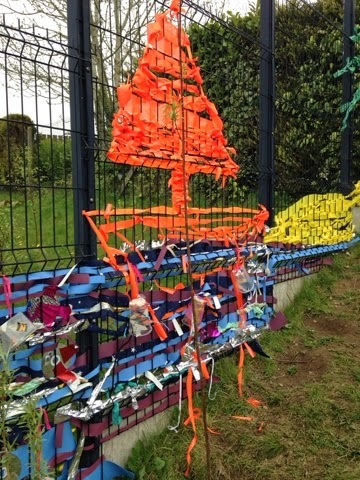 I think it has really brightened up the space and allowed the children to see how they can use existing things like the fence to create art work. My favourite post from the last link up was by Small Wonders on their outdoor kitchen - sometimes simple really is best & the photos in this post perfectly illustrate how children don't need a lot fancy resources to have a fun time outdoors. Managing Risk - Striking a Balance. Children in Iceland are trusted to make decisions about personal safety. Last month I was very fortunate to get a place on a one day course run by Playboard N.I on Managing Risk in Play. This is a course I feel should be undertaken by all staff in all schools, day cares and after schools. Shauneen & Aiveen who facilitated the course where extremely knowledgeable and more importantly had lots of practical background experience. I was the only teacher from a school setting but what struck me the most was that the willingness to embrace risky play is there in most practitioners but if their management is not supportive it can't take place. I am lucky that the Principals of my school have always valued my opinion and experience and trust that I am capable of judging what is safe and what is not within my setting. 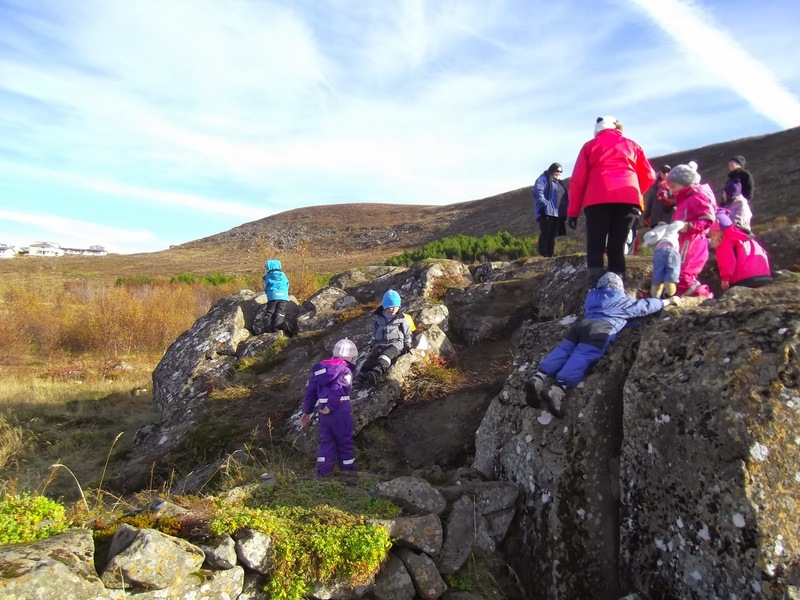 My former Principal & Acting Principal were in Norway with me on my first visit to our partner school and therefore they saw young children using knives, sitting around fires & climbing trees first hand and then were able to understand why I would like to offer such experiences back in at our school. My current Principal, fortunately, trusts my professional experience and knowledge of the principles of Early Education to fully support the outdoor play approach we offer in nursery. The key message from this training was that exposure to risk builds resilience. That is a very important skill to develop in children as resilience will help them to deal with whatever life throws at them. By taking risks in the safe environment of a school playground, young children can learn many things: they will fall, it will hurt, they will be ok, they can try again etc. Most days I will hear children make statements like this: 'If you go near fire you will die, if you don't wear your seatbelt you will die' - we as educators need to help them understand that the risk is not as cut and dried as that. There are reasons for wearing a seat belt but there is no need to scare children into thinking they will die if they don't. The main emphasis on this course was to ensure that people have heard of a Risk Benefit Assessment and could begin to use them within their work places. It was all about people having confidence in their experience and practice so that they could stand over what is happening in their settings. I think the biggest problem that a lot of educators come up against, is buying in lots of resources from catalogues that they have seen in other settings without actually thinking about the children in their setting will use them or whether their space is suitable for them. In June when we have the new children in to visit we do not let them out into the playground as it has been set up for the current nursery class, the main reason for this is that the nursery children are all mostly 4 by this stage and have had 3 terms in the space to get used to the resources and we have worked hard with them to allow them to interact with the many loose parts as safely as they can. We usually have most of the crates and tree stumps out of sight & would certainly not have hammers & nails out for the new children. The children in my class have to learn how to play with all these resources, they learn that crates are very sore when you fall on them, they are slippy on wet days & you can't run on them with your hands in your pockets. It takes time for them to learn this & it takes a few bumps and bruises along the way. We can't possible keep the children in our care from falling, getting scrapes or even getting hurt - not unless we literally wrap them up in cotton wool. We can however, teach them how to assess situations - is something too wobbly to climb up on, is it too high? How could they make it safer? They also need to learn that they won't be able to do something just because their friend can. The main thing I took away from this course was to be open and honest with parents from the very beginning explaining why you want to offer risky play experiences and how such play will help their children build resilience and all the necessary skills needed for life. 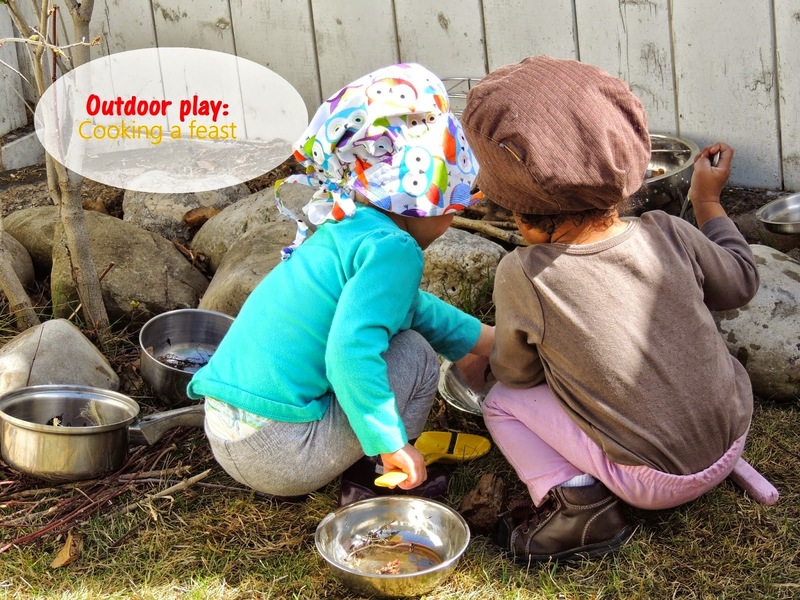 A week of outdoor fun! Even though this was only a 4 day week, we packed a lot of outdoor fun in! 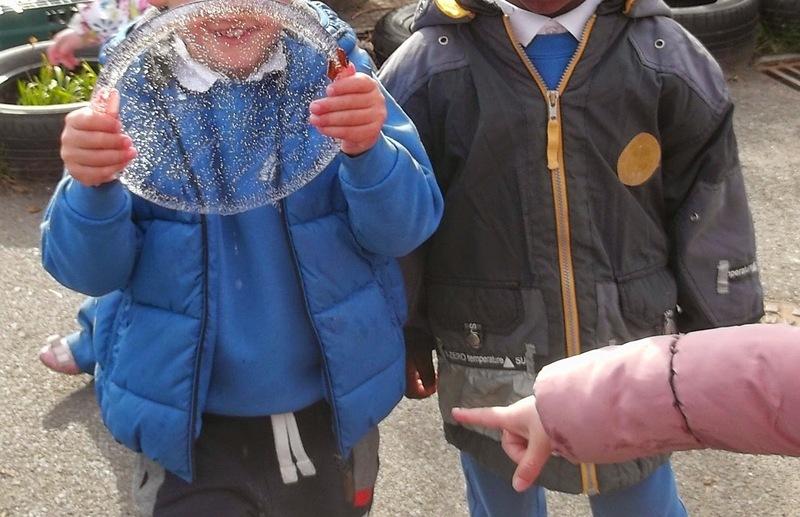 The weather was so changeable too - one day we had lots of ice to play with & the children enjoyed finding different shapes of ice in all the various loose parts that are left outside - tyres, bilibos, red tops etc. 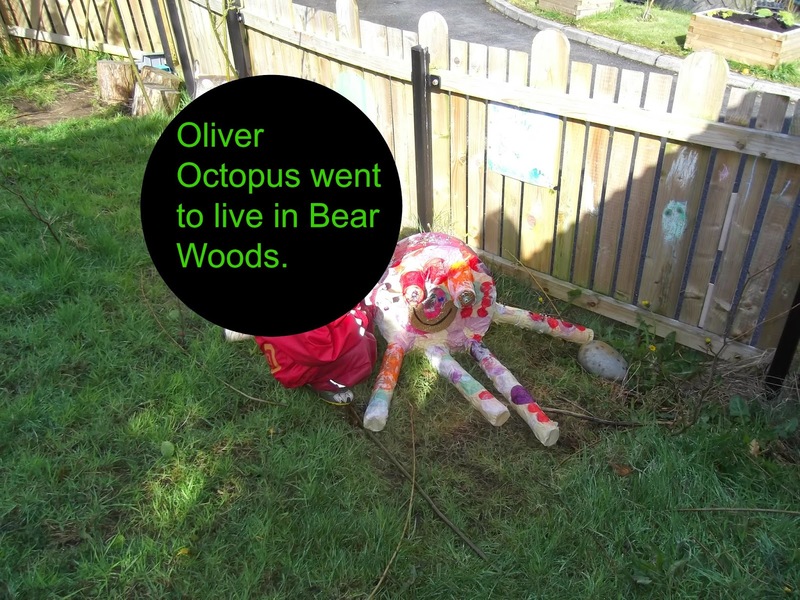 We had made an octopus to live up in Bear Woods & the children enjoyed chalking on the shed and fence as well as watching the workmen installing the new mobile in the main school playground. I think our guinea pigs, Tracey & Fiona, look forward to our weekly visits to Bear Woods as much as we do, as they get lots of juicy grass or dandelion leaves as a present! The children rediscovered the joys of water & compost the week to make some squelchy mud & one boy had great fun painting the wall & mud kitchen with mud & a leafy branch. The compost bins were introduced this week too & have, as always, proved a big success for great play. I loved that this class discovered that a Fafu Andy is just perfect for use as a lid for a compost bin! Here's hoping we have some decent weather for the last few weeks of this school year.